Glaciers are more-or-less permanent bodies of ice and compacted snow that have become deep enough and heavy enough to flow under their own weight. Today, glaciers are found in mountainous regions or in the very cold areas around the poles, and cover only about 10% of the Earth's surface. During past glacial periods this area increased considerably so, although active glaciation is very limited in Europe now, and non-existent in the UK, much of the landscape of northern Europe shows evidence of past glacial activity. Glaciers develop where the temperatures are cold enough to allow snow to accumulate over a period of years. Favourable conditions are found around the poles and at high altitudes in lower latitudes, i.e. mountainous regions such Northern Scandinavia and the Alps. Enough snow must fall each winter to ensure that it doesn't all melt in the summer. This way, the amount of snow lying on the ground gets deeper each year as new snow is added to the remains of last years fall. On north facing slopes it may survive all year without melting, whereas all the snow may melt on south facing slopes ( in the northern hemisphere ). This is because north facing slopes get much less direct sunshine than south facing ones, and thus remain cooler. Fresh falling snow is made up of microscopic ice crystals and has a very delicate structure, nothing like solid ice found in glaciers, but after it lands it goes through a series of alterations to become hard ice. In fact, very cold, and thus dry, snow will hardly stick together at all under normal conditions and would never be any use as ice unless it was changed. As snow accumulates its structure changes. Newly fallen snow is very light and porous,with a density from 50 to 300 kg/m³, but as the snow becomes buried by subsequent snowfalls the ice crystals that make up the snowflakes partially melt and sublimate, particularly at the delicate points of the flakes. The vapour then condenses, and over time the flakes change into granular ice crystals called firn, which has a density greater than 500 kg/m³. As more time passes the firn becomes buried even deeper under more fresh snow and firn, and the weight above it compresses it into solid ice with a density of approximately 900 kg/m³. This is the typical 'blue' ice of glaciers. The time needed to change snow in to glacial ice in this way depends on several factors such as how warm or cold it is and how much new snow is added each year. In fact, it can take anywhere from 5 years in an ideal site, to over 3000 years. The solid ice mass that is produced, unless it is on a very steep slope, wont start to move until its thickness approaches approximately 50 metres. This is because it is only when the ice is about 50m thick, that the pressure is enough to make the lowest, or basal, ice undergo plastic deformation, ie: it begins to flow like a soft or liquid plastic. Side view near the snout of an Alpine glacier, with a 30m wall of ice rising above the lateral moraine. The ice flows very slowly, moving away from the place where the pressure is greatest. This will be the place where the ice is thickest. The ice will even flow up hill if the pressure is great enough. 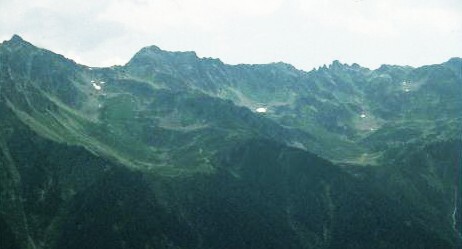 In many regions the areas of accumulation of snow and ice are at high altitudes so the glaciers tend to flow down hill under the influence of gravity. The speed of the flow varies considerably, and in some cases, especially at high latitudes where it can be very cold, the glacier may be frozen to the bed rock so that it flows only by deformation under its own weight. It is as if the ice bends and slowly flows away like a block of toffee. Glaciers that are frozen to the underlying rock surface are called "cold glaciers". In a cold glacier the ice at the bottom of the glacier doesn't move at all, but the speed increases towards the surface of the glacier as the ice deforms. The fastest moving ice is that above about 50 metres from the surface of the glacier. The area of deformation in a glacier is also known as the "region of shear" because layers of ice are sliding over each other. In less cold regions the basal ice of the glacier may melt due to the pressure of the ice and firn above it. This creates a thin layer of water which allows the glacier to slide over the underlying land. Glaciers can also readily slide on a soft sediment bed that has some water in it. These glaciers are not frozen to their bed and are called "warm glaciers". In warm glaciers the maximum velocity at the surface is greater than in cold glaciers because it is the sum of the velocity at which the glacier is sliding over the bed and the velocity due to internal deformation. The velocity of ice flow in all glaciers varies considerably, depending on factors like the thickness of the ice, the slope of the surface over which the glacier is advancing, and the amount of melt water that is available to lubricate the base of the glacier. Some glaciers creep so slowly that their movement can only be seen over a period of years; others advance at several metres per day. When the ice becomes thick enough to flow, the glacier will begin to move away from its source. It will keep advancing as long as there is enough ice in the source area to keep supplying it. Whether it will advance along the valley, remain stationary or retreat again depends on the balance between the amount of new ice collected in the source area and the rate of melting (called ablation) in the rest of the glacier. The accumulation of ice is controlled by the annual snowfall and melting rates. The melting rate is mainly influenced by the temperatures and the amount of debris covering the ice surface. The ablation, or wastage, of a glacier takes place due to several processes with include sublimation, melting and, where the glacier ends in a water body, by calving of icebergs from the glacier snout. Melting is the most important process in almost all glaciers. The boundary between the zones of accumulation and ablation is roughly the same as the limit of year round snow. In other words, the point up the mountain where it becomes cold enough for snow not to melt during the summer. This is called the Snow Line. If the rate of snow accumulation in the source area is greater than the rate of wastage then the glacier will advance, but if the rate of accumulation is less than the rate of wastage the glacier will retreat. When accumulation and ablation are equal, they balance each other, and the snout of the glacier look as if it isn't moving. In fact, ice is always flowing towards the snout of the glacier whether it is advancing, retreating or seeming to remain stationary. Ice can deform under pressure, but most of the ice isn't all that good at it. Unless the conditions are just right, it's more likely that internal stresses will build up in the ice and it will crack rather than deform. This is especially so where the ice encounters a sudden increase in gradient and is stretched faster than deformation can accommodate. This results in fractures developing in the ice, often narrowing at depth and widest at the surface because the ice is being stretched with a point of rotation at or near the glacier base. These cracks, which generally run at 90° to the glacier are called crevasses. 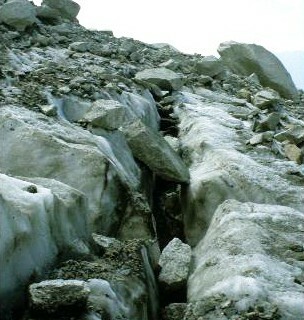 Through crevasses melt water and rock debris can be transported to the base of the glacier where they aid in the erosion of the bed rock. Crevasses are often the most obvious features on the ice surface, appearing either on their own or in groups. 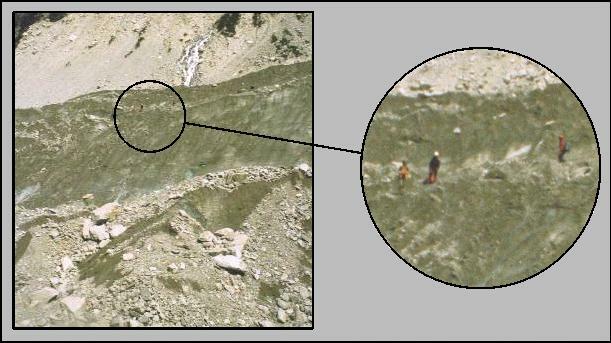 They present a danger to climbers and others who have to cross the ice since they are not only deep and smooth sided, they can be covered over by fresh snow that gives way under foot.